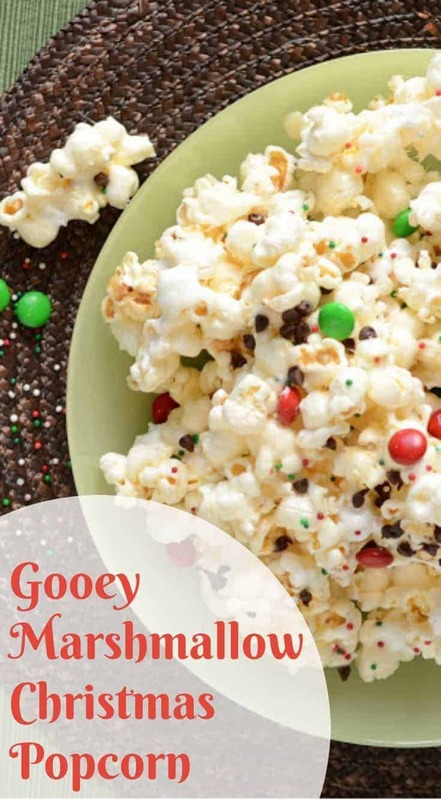 The best gooey Marshmallow Christmas Popcorn with Chocolate is a treat that your whole family will love! 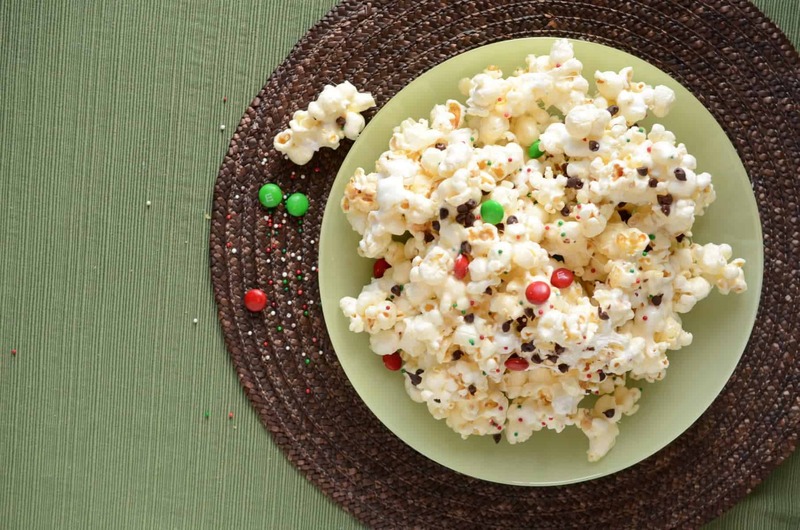 One more popcorn recipe before Christmas, OK?! I know my love of popcorn is bordering on addiction, but I also know that I’m not the only one who is so fond of the stuff. Popcorn lovers unite! I grew up in a big family with tons of cousins close by. We would all descend on my grandma’s house on Sunday afternoons to play and enjoy the delights of family time. In the winter, grandma would stand over her stove with a stove-top popper that you turned by hand and then load metal cake pans full of hot popcorn that was a little greasy and a lot salty. I can still smell that hot oil and grain smell. Once in a while my Aunt Joanna would make some of the popcorn into caramel corn while Grandma was at the stove. 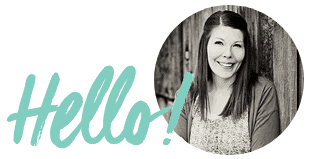 She’d dump giant piles of caramel corn on the waxed-paper-covered counter and we’d swarm like sugar ants. We’d try to pick out the gooey-est pieces while attempting to avoid getting our fingertips burnt by the hot sugar. Hmm. So maybe my love of popcorn is part genetic, part nostalgic, and part taste-driven. I wanted to make a sticky sweet popcorn that wasn’t caramel, so I turned to my mother-in-law’s recipe for a sweet Chex mix she makes. I used the basics of the recipe and then swapped popcorn for the cereal. I added some mini marshmallows that started to melt a bit when they got hot from the sticky coating and then threw on some chocolate in the end. The results were just what I was looking for! 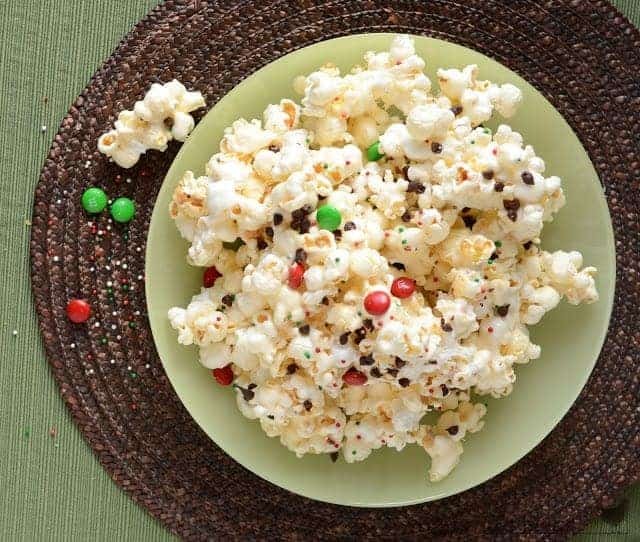 Sticky, sweet, marshmallow pockets and bursts of chocolate mixed in with crunchy popcorn. You just can’t beat that in my world. Turn that into Christmas popcorn and I’m really sold. The goal is to not let the hot popcorn melt the chocolates, so if you need to wait longer than 2 or 3 minutes then do that. My kitchen is super cold and so it cooled pretty quickly. You need to stir the chocolates and sprinkles in before it cools too much though or they won’t stick. Feel free to half the recipe if you don’t need tons. It does make a great and inexpensive gift to give though. Half for you and half for them? Add more chocolate if you think it needs it; the recipe is yours to play with. You have some options when it comes to popping the popcorn. I like to use my air popper (we use this thing multiple times a week; it’s one of the few single-use appliances I keep around), but you can also use this fun method of popping popcorn in your microwave. A stove-top popper/pot with a lid on the stove method will work well, too. Other popcorn recipes that I love for the holidays are this sticky caramel corn that my mom makes (it’s so good) and this spiced white chocolate caramel corn (it’s not sticky). Both are great. In a large bowl, mix the popcorn and mini marshmallows together and set aside. In a medium sauce pan over medium heat, combine the sugar, corn syrup, and butter. Cook over medium heat until the mixture comes to a boil. Let the mixture boil for 2 minutes while stirring often. Remove from the heat and stir in the salt and vanilla. Let the mixture cool for 1-2 minutes. 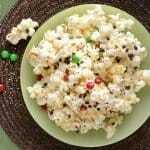 Pour the sugar mixture over the popcorn and marshmallows and stir well until the popcorn is evenly coated. Let the mixture cool slightly, 2 to 3 minutes, and the add the M&Ms, mini chocolate chips, and sprinkles. Stir lightly to combine and then turn the mixture onto waxed paper to cool. Let it cool completely before enjoying. The goal is to not let the hot popcorn melt the chocolates, so if you need to wait longer than 2 or 3 minutes then do that. My kitchen is super cold and so it cooled pretty quickly. You need to stir the chocolates and sprinkles in before it cools too much though, or they won’t stick. 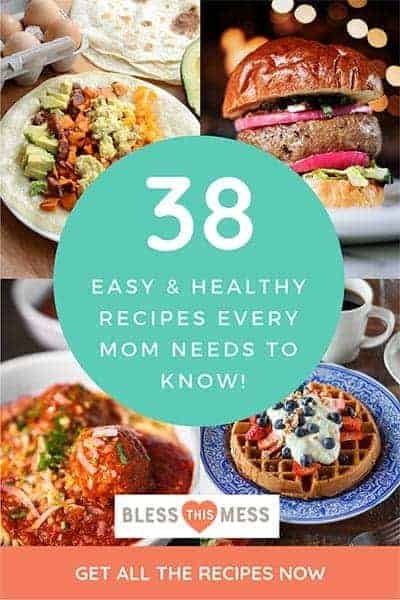 Feel free to half the recipe if you don’t need tons. 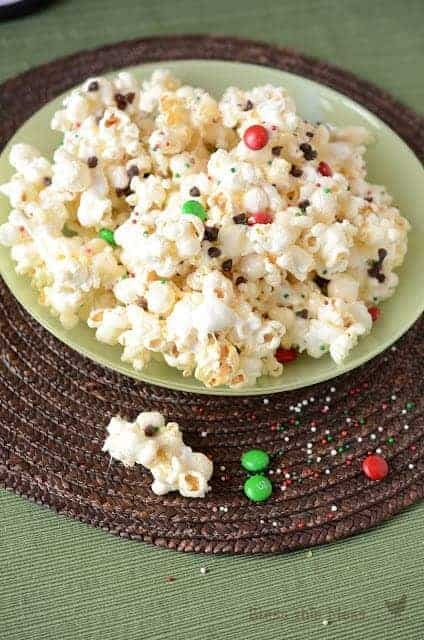 If you don’t have anyone to give this Christmas popcorn to, then you might want to just find the movie ‘Elf’, bring a bowl of this to the couch and go to town. I promise it won’t last long and resolutions don’t start for another week, right?! I think Santa will be getting this instead of cookies at our house. Merry Christmas everyone and thanks for reading! This post was originally published in December 2012 and was updated in December 2017. I’d love to curl up with a bowl of this all winter long. How far ahead of serving this can it be made? Has anyone tried this with Chex in place of the popcorn? What a great idea! I love popcorn, especially the sweet kind. Just in time for binge TV watching.